Kate Middleton supported East Anglia Children’s Hospice yesterday, June 22 (that’s twice in one year, wow). Kate attended a “Taste of Norfolk” gala dinner at Houghton Hall with Prince William, the proceeds of which benefit EACH’s “The Nook Appeal”. The Nook is a planned new hospice in Norfolk which is larger than previous ones and can accommodate the demand for EACH’s services. EACH is looking to raise £10 million to build The Nook, and so far they’ve raised £2.5 million. Kate attended The Nook Appeal launch back in November 2014. Yesterday’s dinner was expected to raised in excess of £100,000 with guests invited to donate to the cause (though they were not charged to attend). The gala dinner at the stately home of the Marquess and Marchioness of Cholmondeley featured a champagne reception, and a special five course meal prepared by five Michelin-starred chefs. The Treehouse Choir performed after the dinner, followed by a speech from parent Charlotte Markham. Author and EACH Ambassador Anthony Horowitz OBE and The Marquess of Cholmondeley gave speeches to close the evening. I don’t get the joke. Is William shading Kate’s cooking skills, or is he trying to imply that she only cooks healthy meals? I wish this event had been better attended by the press and photographers because Kate repeated a gown that many people like: this Jenny Packham pearlescent sequin gown from the SS11 collection. Below is Kate wearing the gown in 2011. Kate’s accessories where largely the same: pink Prada clutch, and LK Bennett “Agata” pink sandals. Kate upped her jewelry game for the gown repeat, though. Wearing the diamond chandelier earrings on loan from the Queen, and Queen Mary’s Diamond Choker Bracelet. The Choker Bracelet was worn as a choker by Queen Mary, and converted to a bracelet by the Queen Mother. Since this is Kate’s third time wearing it (she first wore it to the Chinese State Dinner in October 2015, and wore it to the 2015 Diplomatic Reception as well), I’m wondering if this is a “lifetime loan” situation from the Queen like the earrings seem to be. Kate also wore an updo which she didn’t do in 2011. Another fashion win here for Kate: I think she looked great in a fantastic gown, I like the addition of the larger jewels, and I like the updo. In case you were wondering, Rose, the Marchioness of Cholmondeley (pictured below walking with Kate) wore a dress from Valentino’s Resort 2016 Collection. Kate added another event to her schedule: She will present the Art Fund Museum of the Year 2016 prize at a dinner hosted by the Natural History Museum on July 6. OK, lets start with a positive or two – It’s a very pretty dress, I like the updo and it’s nice to be able to see the earrings. But, blimey, is Kate really wearing that much makeup? I’m hoping photo 6 was when the sun caught the makeup at the wrong angle, If I wore that much slap my skin would break out! Kate cooking for William every night? Yeah, right! I’ve been to Houghton Hall and It’s very beautiful and worth the long drive from Norfolk to go visit. It was nice for the Cholmondleys to host the event, if tickets weren’t sold to the event then does that meant they covered the cost of the event. If so then it was a generous thing to do. Rose Cholmondley is very beautiful so I wonder if we will see photos of Kate standing next to her? Yeah, that quote seemed like such bull. When I read EACH’s press release, it did sound like the Cholmondleys paid for the event, but I’m not sure on that. According to Richard Palmer (the only royal reporter to go to the event), the wifi was terrible there. The wifi is also bad at Sandringham. I keep thinking that it would be horrible to live in a place where the wifi was that bad. How does one live without the internet? I’ve had a few days without internet at home recently – it was torture, my nieces were not impressed with me at all when they came to visit. Lol. My computer broke last year and I had to wait several days to get my friend to fix it, and being without a computer was so horrible for me that I went out and bought a cheap one the next day which I returned once I got mine fixed. I just couldn’t be without a computer. I would go mad without internet. KMR, Emily Andrews and Victoria Murphy both mentioned that only one reporter was allowed, and it sounds like they all agreed on Palmer. I think it’s interesting that he was the only reporter there. Hasn’t he been pretty critical of them lately? KMR: This was a very descriptive article on the EACH gala evening. Thank you! It would be wonderful for K&W to follow suit and host a few galas for their charities at KP, as well. I’ve read that KP has been the venue for some other social gatherings, e.g., a wedding and 007 Spectre, plus BAFTA. But, even though such events are in K&W’s backyard there’s no guarantee the two will attend — their no-show at BAFTA comes to mind here. With respect to William’s comment on Kate’s cooking, I can’t help but shake my head in disgust over K&W’s insistence to add a second kitchen at KP, which I doubt was ever used by Kate. Their actions and total disregard for the misuse of money that’s not theirs is absolutely despicable. And, let’s not forget the moving of the tennis court at Anmer Hall,which they proclaimed would give them a better view. I wonder if this two-some will ever grow up? Somehow, I believe their actions are based on competition with some of their friends’ homes and lifestyle, and by now, I’m sure we are all aware of Kate’s competitiveness. As I look at William’s face and his very tight jawline, coupled with a somewhat similar expression from Kate, I’m wondering whether they are frustrated, bored or had a difference of opinion prior to the speech. Something seems amiss. I find the hairstyle more fitting for her role – in the 2011 picture to me the hair-do makes her look like just another glitzy film person. Cook for her husband nightly? Don’t believe it. Active, involved, enlightened? – Cholmondley needed to be polite, he is part of the establishment, after all (and her host that evening). Kate seems not to have learned how to change her gait when in evening dress: the footsteps are unsuitably big. Beautiful jewellery; I don’t think she has earned the right to wear it…..
@Rose: “Kate seems not to have learned how to change her gait when in evening dress: the footsteps are unsuitably big.” I wholeheartedly agree. I’ve always thought that her stride and other actions are very manly. Kate does not walk like a sophisticated woman should, with small steps. It’s even more noticeable whenever she is wearing a tapered skirt — it’s as though the skirt would split at the seams from the pressure of her legs against the fabric. I think her entire demeanor from her chin down, is masculine like. She cannot clap (her hands are very withered and old looking due to fat loss from dieting) nor get out of a car, and most of all, behave lady-like while in public view. Kate needs the help of a coach on how to behave like an aristocratic woman should. She’s a very poor role model for young girls. Poor Charlotte! I like the idea of this but the matronly hair, poor posture, and how sick she looks just throws it all off for me. I don’t like Kate, but I worry about her with how terrible and ill she looks. She seems as if she works out a lot but also doesn’t eat. Emaciated yet muscular. Not healthy at all. Funny how they’re trying to raise money and how W&K could have slipped some cash into their coffers, but William is notoriously cheap. I hope they get their money’s worth with having W&K there at the dinner. And I hope they raise their money for the hospice. EACH is a great charity. Sad they have such a dud for a patron. If you want Kate to show up, charities, do a formal dinner where she can gown up! That’s the only way! Thanks KMR! Hope you had a good day. I’m still frying here with no air conditioning. Ack. I actually think a fundraising dinner is a good middle ground for Kate. Since she doesn’t like actually getting involved with the kids and making them happy and/or raising awareness for the cause, at least she can raise money for the charity while not doing things she doesn’t like. This is going to seem weird, but I did notice that Kate’s breasts seem smaller in the dress this time versus the first time she wore it. I’m sure there are many reasons why that would be, but it is something I noticed. I’m with you KMR, I thought Kate had forgotten to wear a padded bra or pop in some chicken fillets too. And the dress seemed to be sticking to her pantihose too as the skirt part seems to be hanging funny. Apart from that I still think this dress looks great, perhaps the reason is that it doesn’t appear to have be altered by Kate in anyway. Kate should repeat this same dress shape again imo. I really like this gown. It’s one of my favorites from her. I loved it when she first wore it, I was like “oooo, a princess! !”, and she was still super tiny from losing weight for the wedding. It seems like the dress is wearing her this time around, and I just don’t love it quite as much. Cathy, we’ve seen that she doesn’t wear slips. That’s what you’re seeing here. The skirt is clinging to her legs, spoiling the line and flow of the dress, because she doesn’t have on a slip. Not wearing the correct under garments can totally ruin the look of an outfit! why why why doesn’t Kate get that? *Wearing* the right under garments would inhibit any possibility of flashing in some way. And you know how she loves to do that. I think that’s about the only thing Kate can do insofar as giving publicity to her charities, yeah. These dinners, I mean. I hope EACH didn’t spend a lot of money hosting it but I assume the Chomondeleys did which was very kind of them. Gets them some net good PR as well. I love most of Jenny Packham’s clothes but this looks so dreary and dull on her, especially compared to the 2011 outing. She was glowing and had gotten the golden ring so I assume she was still on her high of finally nabbing William? I agree about her face looking overall more radiant back then. The dress doesn’t fit her bust or her waist at all, the terrible posture and hunching make her appear all hollowed out somehow. Not healthy, the vast amount of makeup doesn’t help enhance her look in any way. Kate doesn’t necessarily turn up to every formal dinner, she didn’t attend the Ralph Lauren dinner which was for The Royal Marsden. Eh, while I complained about that at the time, I can understand not going since it isn’t her patronage. I do think it would be smart of her to go to her all of her patronages’ fundraising dinners. It’s an easy way to bulk up those engagement numbers. Ralph Lauren had donated buckets of money to Royal Marsden, it was rude not to show up if she had been invited. Slightly better than ditching an event where her name was on the invites, as she did on another occasion. I, too, am tired of her matronly updos. Her dress is nice, but I’m too distracted by how unhealthy she looks. Agree LizB. Kate really looks unhealthy and I’m tired of her her matronly updos, too. But she’s always been predicable, so I’m not surprised. Oh, you are here, I was positive you had your baby on the 18th or 19th. How are you?! Sending all kinds of good wishes! LizB, do we have a baby yet? How are you feeling? Ellie, I agree. She looked way too thin. Sickly, I thought. And, definitely, not healthy. The dress is ok in my book, but looked better the last time because even though she was thin, she is even thinner now. And, it smacks of illness. Someone better take a hand and help her. What did the gentleman mean when he said he felt like Mussolini? That sounded creepy. William’s joke was totally insensitive. While I doubt Kate cooks daily, I think he was saying that her cooking is not appetizing. What a jerk. And, did he look pompous and bored in the profile of the couple together? Ellie, no a/c, still?! Is it a problem with the power in your area, or is your unit on the fritz. Gosh, I hope for everyone’s sake out where you are that things cool off. Oh, wanted to add something. It’s not just her shoulders that are slumping. Have you noticed, she tilts to one side. I notieced that in one of the photos outside the Church on her wedding day and have seen that several other times. She slants to one side. Ugh. Me too I don’t understand the joke with Mussolini. Anthony Horowitz gave his speech from a balcony overlooking the garden. It must have looked like he was addressing followers below him, like a rally. Mussollini often gave his speeches standing on a platform above the crowd. Anthony Horowitz’s most recent work is about dictators. I presume taken in combination that was the genus od the mussollini joke. Mussollini is a safe dictator to make jokes about because he doesn’t have the reputation of other dictators eg Saddam in terms of the horrors of his rule. The first picture of Kate looking up whilst clapping shows her head tilted to the balcony above the guests from which the speeches were given. No, our unit just kicked the bucket. It’s over 35 years old. Sigh. I’ve called a few companies, I hope someone gets back to me! 🙁 I’m meeelting! Kiddo and I are spending most of our days at the pool. You’ve summarised my thoughts when i saw these pictures. I thought she’d lost too much weight in 2011, yet this dress fit like a dream and her posture was good. Fastforward to yesterday and She’s hunched over and the dress is hanging as if she’s much thinner than she was in 2011. The hair makes her look like a young matron or widow circa Jane Austen country. Her face is so thin this time that the dimples are running from her cheeks to touch at her chin. And the pictures are heavily photoshopped, imagine the reality because i can see the dry hair, dry skin, too much make up AFTER the photoshop wizardry. I have read that as well, Jet. I am very happy with my chipmunk cheeks! I really liked this dress the first time. Still like it. I find it blah that she wore the same shoes and clutch though. Girl has no clue when it comes to mixing and matching. Not a fan of the matronly updo either. Her hair person needs to go. Like the bling. Her posture is still atrocious. But no crotch clutching, that I saw. She looked a lot more into the event. Maybe the champagne helped to loosen her up? Overall, a win for me here. I was thinking Kate would repeat a dress tonight and i am glad she chose this one! I loved this dress the first time and still love it! Her shoes are also one of the only pairs i actually want. Too bad they cost so much or else I would buy them :). I like her jewelry tonight. I am glad she wore a bracelet different form her usual one with diamonds. I am also glad she wore an up-do. My only criticism is, i am not sure i like her hair tonight. From the side it looks good, but from the front there is something off about it. Maybe it because it looks like it could come undone at any moment which would drive me nuts if i was her. Also, Kate, you are prettier and younger looking with less makeup! I once knew a lady who was *anorexic who drank white wine all the time because she got her (few empty) calories from it. Apparently many anorexics do this. *i’m not accusing Kate of being anorexic even if her current weight is alarming. Anyhue, seeing this super skinny Kate with a glass of wine in her had is triggering alarm bells for me. Especially seeing how skinny she is compared to the first time she wore this dress, and that was an era where she was so skinny that you could see the bones in her chest. You can’t miss the difference in five years. I realize she may have her arms in a different position, but when you compare her left arm now and five years ago you can see the change. Her neck and face look thinner. On someone who is already thin, ten pounds less can make a big difference. I have always liked this gown and I don’t mind the hair. Considering some of the expensive ugly things she has worn in 2016, I consider this a win. This gown is my all time favourite gown from the Duchess.I wish I could wear it.The silhouette,the beading,the neckline I like everything about it. The up do suits this gown more,because when the hair is pulled back we can admire the neckline of the dress more. The neckline really does it for me, it really is one of her most beautiful dresses. I like the jewels, the dress. I prefer when her hairs are up, but on some photos it looks not very good… And I don’t know if it is her make up or if she has made UV , but her skin seems more tan. I am not a fan of her make up. I think that she likes when she has just to turn and smile, and not speak. This dress is really gorgeous and she looked really good the last time she wore it. She was radiating with confidence then. Now with a bad hunched posture and a matronly updo, she is a shadow of her former self. I love her hair up instead of her usual heavy and messy look, but this hairstyle actually screams ”I’m here, I’m 45. Get used to it.” I wish she’d just tie her hair up in a ponytail. There are many gorgeous ponytail styles she can experiment with. But this is Kate – predictable with no imagination. So I can’t say more. I can’t help but feel almost certain that the reason why she’s looking terribly aged and tired lately is because of William. His bully attitude really shows. He can’t say anything nice at all about anyone, including his own wife! At first I dismissed it as a joke or he’s just teasing her but he practically does the same to almost everyone! There will always be some sarcastic remark coming out of his mouth that I am now assured it’s his real attitude! If he behaves this way in public, I shudder to think how he is in private! Kate must be taking it all in and there isn’t anyone she can confide in or seek help from because I think her meddling mother won’t want to hear any hint of marital woes with the “Future King”. For that, I really feel sad for her. Ooh,I thought about a ponytail as well.Also,what about a braided up do?I think that would look smashing. But I don’t have a problem with the Duchess not doing something different with her hair.I get it if she’s not into hairstyles.I myself am not , when it actually comes to making them.Her job is to look presentable and she does that over here.NOT when there’s flashing! Hi Candice! OMG!!! A braided updo, yes!!! I wish Kate would look at Natalie Portman’s red carpet hairstyles especially her updos because the ones she sported were very beautiful, yet fresh and youthful. Not aging at all. I can understand why you would think experimenting different hairstyles is a hassle. I do too! But for Kate it is a whole different scenario. She has people doing her hair for her. And a professional hairstylist at that! So a bit more effort from her part is what I expect. I think, Sarah B, that maybe William is to blame but Kate, after nearly a decade of stalking knew who she was going to marry. She knew him and knew it all. And she was nearly 30 when she got married, so an adult, not a teenager. Kate wanted that ring, the posh life, doing nothing every day at any cost. Both William and Kate knew who they were marrying and why; it was just a transaction and I’m sure neither was surprised to find each other pretty awful. That surprise – the abject laziness and self-absorption – has been for the thinking public to come to grips with. Whatever state their marriage, they both created and perpetuate it. I can’t help but think that’s the absolute truth, Jen. They are up here and we are down here and we will just have to deal, whether we like it or not! I know Livia. I also cannot bring myself to pity her after her history of stalking Will … but the emotional side of me just feels sad to see a fellow woman living in abject misery because of a man and she can’t/won’t seek help (if it’s all true …). Sarah, you are so funny. “I’m her. I’m 45. You better get used to it.” Gosh, if it wasn’t so alarming to see her so very thin, I would still be laughing. LOL! Yeah, Jenny. I think we can expect those words from someone who is adamant that she won’t let criticisms get to her. Sarah B, love the pony tail idea she always looks outgrowth her hair that way and I agree that she seems isolated alone in a crowd.. I have a question : she has an engagement on July. If we don’t count Olympic, Wimbledon, birth of George and baptem of Charlotte, has she ever had an engagement on July? And that KMR is why we love you! So much detail at your finger tips. That really sounds more like things he has to say than something he really means. He could hardly say something like /oh we are surprised she showed up/ or /those letters she sent are rubbish/. He has to be friendly and he needs to praise the patron, otherwise she never shows up again. But beside those dinners, which are ofc good to raise money, I’m interested to see what will follow. Will she actually begin to visit her charities mlre often? Talk to people working there? Patients… and will she actually learn something about the cause. I would really hope so but at the end it’s Kate. There had been too many disappointments in the past unfortunately. I actually like her hair for this event… but OH MY GOD… she really really needs to work on the posture. I’m starting to believe that galas and posh receptions are about the only thing patronages can do to attract her to attend their events. That new engagement seems like another glittery event. Anyway, I kinda expected her to do a repeat although in my mind it was that dress she wore during the Spectre premiere. Overall, a better styling for than the first time she wore this. But man, that photo of her holding a champagne and walking really shows off her bad posture. The Kate of 2011 who was wearing this gown & the 2016 Kate seems like 2 different ladies. It looks like the 2011 Kate lent her beautiful gown to her skinny & gaunt looking auntie. So sad! She’s wasting away! Is this due to the pressures of being in the royal family or being married to William? I just don’t see all this “scary” weight loss so many have talked about. As far as the quote from William- it sounds like a “dad joke” to me. A dumb dad joke you hear at millions of cocktail parties. And she totally set him up for it. It’s probably one of those rehearsed things that couples often have together. Like when you ask a couple the story of how they met and they tell it in the same way every time. Kate totally set William up for that line. It’s endearing to me. This couple has been together for a loooooooong time. They probably have a lot of little anecdotes and “jokes” like that. Yeah, I could believe this if he wasn’t consistently negative and rude about every person he’s with, including his brother and his own son. William’s a narcissist. He completely buys into his own hype. That wasn’t a ‘dad joke,’ it was a slam. I don’t feel bad for Kate, she chased that whole situation, but I personally can’t wrap my head around it. I probably don’t put up with as much as she does and I work for a living. I’d be miserable in her situation. AMEN! Not only can you earn your own money, no-one controls you. And if they try, you can point them to the door. I don’t understand women chasing a meal ticket either. But I do know they should not be put on a pedestal. It debases women. I once thought William’s jokes were ‘dad jokes’ but they are not just lame, they are mean and derogatory which ‘dad jokes’ are not (just weak and often self-deprecating). William is a very aggressive and deeply unpleasant man. Oh Amen to that. And such a feeling of empowerment comes from earning your own good money and not needing/expecting a man to financially support you. A girl should always strive to have the means and ability to look after herself. If the guy you fall in love with and marry happens to come with a little cash…well, good for him. I’m with you Zoe! I read William’s joke as a Dad Joke as well. To be honest, I would probably say the same thing but I’m lame too. I think Kate’s body has changed (as one’s does) after having two kids. I had a co worker that really struggled to put on weight after she had her two children so maybe Kate is going through the same thing. That dress is one of my favorites and I think she looked really pretty! I guess we all see things differently, but I am aghast that you don’t think Kate looks sickly in these photos, I can see a difference in her weight in today’s photos vs. yesteryear. So many others do, too. The profile photos are especially gaunt. And, in U.S. weight, they add about ten pounds, so I simply cannot imagine how thin she really is. Her posture is terrible and in the photo where she appears to be hobbling along the lawn, a wine glass in her hand, I think she looks like an old woman. Isn’t anyone in her family concerned? Does anyone think that Will is still showing up for his helicopter job? It seems like it’s been a while since anyone has even mentioned it. The press, I mean. I can’t wait to see if he’s got the sheer nerve to take another gap/transitional year. Oh, Red Snapper. I am with you. I wonder why we have not had little PR tidbits tossed our way about his ability to save lives of late. And, yes, I think he may need to take another gap year soon. He needs time to find himself and enjoy life before he has the burden of the crown on his balding head. Wow… This dress in 2011 was my all-time favorite look of Kate’s. The difference is appalling. With her posture and gauntness, I really see now the “short legs, long torso” thing she always tries to hide. I’d seen it before but never realized just how off her proportions really are. Like someone said upthread, it looks like 2011 Kate loaned this dress to her spindly old aunt or something. She looks like a shadow of her former self. This is one of my favorite gowns, but I liked it most the first time she wore it. She was glowing. OMG, Kate’s posture in the second photo, what is that????????? She is getting worse in her posture, IMO. I liked the updo but it seems a bit matronly. William looked bored as always. And Kate cooking for William every night, realy?????? I can’t believe it. “The Duchess is a wonderfully active,involved and enlightened royal patron to EACH” Ridiculous!!!!! Loved that she rewore this dress, as I have always put it among my favorites. And, I don’t mind the updo at all, I think it looked nice. The close ups show way too much makeup. But I thought she looked like she was enjoying herself, and this month has been a nice surprise for me with some truly lovely looks and a happy demeanor. I hope she keeps it up! I much preferred this wear over the 2011 one. I think in 2011 her hair ruined the look for me, despite loving the dress. Her hair was so stringy and piece-y looking, like it needed a good brush through. I love it when Kate wears her hair up, and this time it showed off the detail around the neckline and shoulders. Has the neckline on the dress been changed ? The difference between the 2011 photo of her wearing the gown and last night is shocking to me. Yes it was 5 years ago and we all age, but to me she looked a lot…..healthier? in the older photo. Is it that she was heavier than? I can’t seem to figure it out. Hi, Eileen. I think she was several pounds heavier in the previous photos. And, her health may have been brighter. Her skin is sagging and it’s apparent she is not getting enough protein and fats in her diet, as someone already said. Kate is wasting away, if you ask me. It would benefit her to have an intervention (Katervention) by those who really love her. Her health is at stake, if you ask me. What a poor role model for Charlotte, if this continues. Lovely dress and jewelry. One point for an updo, but I do wish the hairstyle was fresher and more youthful. It is a bit weird that her shoulder blades protrude more than her bust. Lots of passive aggressiveness going around. I snickered at the organizer’s quote “I would like to thank Their Royal Highnesses The Duke and Duchess of Cambridge for agreeing to join us for this amazing evening.” So…almost sounds like they had to coerce the lazy duo into *agreeing* to show up. Gee, just a few days ago Kate was giving Harry cooking lessons. Thought that was another of her dazzling, amazing and stunning talents? I didn’t quite get the “joke” either. William could have made an effort to look slightly interested. Poor boy was sulking about missing the football/soccer on the telly, I guess. I like her overall look (the dress, hair, jewelry, etc)! The only minus point I noticed is her posture, which doesn’t quite make sense if she works out alot (as I’ve read in other comments)! Thanks, KMR for your hard work. Wills looks his usual glowering self. For all his arrogance, he’s nothing more than Carole’s tool. I wonder if he knows that. Kate is her usual emaciated self in another flouncy dress. In the second photo she crosses the lawn in search of a man who will talk to her. The positives: beautiful dress, gorgeous jewelry, lovely up-do, great venue. The negatives: poor posture and too heavy makeup. The alarming: her weight. I hope she is getting help, because she is horribly, unhealthily thin. If the camera adds weight (and it always does for me), imagine how she looks in person. William annoys me no end. He is such an a**. I think nowadays we are having two extremes , obese people or too thin ones , and both are not healthy for the on run , the media and their focus on the less than 8 size is really harming our girls and some public figures like kate are not helping as well , I don’t know what Kate is doing or going through to be so thin , and I really wish her happiness , but I have to admit that she has her influence on girls and teenagers nowadays and hope that she would use it in a good healthy way . This is sucha good point. Not too long ago she hosted a sports aid (?) event at KP. She wore that shoulder cut, royal blue, sleeveless long dress. The blue was a bit of her “theme dressing” as I noticed it matched the logo perfectly – some pictures were taken in front of a fountain outside with huge logos on each side. Anyway, Kate was standing next to some 10-12 year olds and she made them look “wide and fat” 😵 I remember thinking I would’ve been completely traumatized about my weight and body had I been bigger than a grown 35 year old mother of TWO at that age. Yikes! I don’t like Kate but I wish her happiness and health for herself, her children and the millions of women and young girls she could possibly influence and stand next to. Too bad her controling mother and her fit and healthy sister haven’t paid enough attention or been able to help. Kate’s size in comparison to the children is what really stood out for me from the SportsAid dinner pictures as well. She was slimmer than all of the ones right behind her, and they appeared to be normal sized children. I can’t imagine how frighteningly thin and frail she must be in person. That’s because William isn’t funny. He seems to think he is, but he isn’t. It must be that since he is a future King everyone around him has felt obligated to politely laugh at everything he says his whole life so now he actually believes he is funny. But at the best of times he comes across as awkward and at the worst he can be downright rude. Sorry if I am repeating what anyone else said, I haven’t been able to read all the comments yet…. I like this gown. But is it just me or has Kate lost even more weight? It doesn’t seem to fit her as properly around the chest area, it kind of hangs on her chest. It’s nice that they were able to raise money but that speaker who called Kate an “active patron” must be high or something. When was the last time she actually visited the hospice and interacted with these children? Just to clarify, I have had my issues with overdieting when I was young and body image issues so I am not trying to body shame Kate by saying that she seems thinner. I actually think it is cause for concern. She looks positively frail some times, especially her shoulder blades which seem to protrude even through heavy coats. I also think it would be nice if Kate spoke with a makeup artist about updating the way she does her makeup. If she wore less eyeliner it would be more youthful and fresh. Kate has pretty eyes and I know she wants to highlight them but sometimes less is more. I’d like to see her experiment with different lipstick colors, too. One final thing: It would have been nice if Kate said a few words, even if it was just a little “welcome, I’m glad you are all here” speech since this is her patronage. Should she be expected to give a speech if the wasn’t a host? The makeup–she looks like a drag queen with the excessive eyeliner. Yikes. Hi KMR, great post, and hope you are getting a little R&R this summer. I was struck by the DM article. To me, it was iron fist in the velvet glove. English/Cliff wrote nice things, like Kate’s “friendly hand” on Horowitz’ arm felt a little insinuating. William looking good in the tux and dickie–he’s blurred in the pic, so we get a great shot of haggard Kate with noticeable mousy regrowth with grey. Kate “looks great” in her dress from six years ago with crazy face picture above (her crazy faces! Please KMR do a calendar–I would buy it and laugh all year–not nice but no one does crazy face like Kate). Sorry for the sidebar. There are good pics and it was a positive event for Kate. I totally agree with you KMR; this is what Kate should be doing. This is a continuation of the dating years clubbing and tossing back some drinks. I think this is the only thing Kate is semi-skilled for, so if she can use her clubbing skills to raise money, so be it. The jewelry and dress are beautiful but Kate’s just wearing them, if you know what I mean. William, never forget that you married this boring, shallow woman, but she’s partly of your making, because you never did anything useful or beyond superficial in your life. Charles must have threatened Will’s allowance in order to get this level of activity out of his lazy son. It’s a little late for Charles to stop pampering Will, trying to make up for cheating and the divorce. But money talks and Will seems to listen to money. Kate definitely sparkles while soaking up goodies like French Alps and Mustique. All the proceeds to one of Kate’s charities that she continually blows off. I do think this is a pretty gown, but as usual, no wow factor at all, which is what I thought the first time she wore this gown. I do not think she has lost more weight since she first wore this dress, she is as thin as she always was. I am sure she is vigilant about her weight and rarely fluctuates more than 2-3 pounds over her desired weight. Now the however part….. She is aging very quickly for such a young woman, some of it is probably genetic, such as she already has quite a bit of gray hair if you look closely at some of the pictures. Her skin looks saggy and coarse (even though it looks like she has on LOTS of foundation) which could also be attributed in part to a lack of good protein and fats in her diet. She was way more radiant looking 5 years ago, plus she needs to wear some lipstick, nothing garish, but it could light up her whole face. I sound like a broken record, but I hate the reddish hair color, it washes her out…check the difference in her hair color 5 years ago when she first wore this dress. Then again, she may have so much gray that when her hair color fades it is leaving a reddish tint, that can sometimes happen, which means she needs a brown hair color that has an ash base and no red or orange in it. One other thing was that I did notice initially that this event was buried way down in the DM, but then later was made more prominent….interesting , no? I like this dress too. With the green background and everything it looks so beautiful. I refuse to complain about the updo, we asked and asked and now we have updos. I agree about not commenting about the updo. The style may be boring but at least her hair is up, which is a vast improvement for her. What a difference 5 years makes–and not in a good way!! 2011: newly married and riding high on the fact that she and William were (finally!) man and wife plus, she was riding on the wave of all the good press. She’d obviously slimmed down for the wedding but she was glowing and her happiness was obvious. 2016: Five years, 2 kids, and numerous scandals and snafus later, she’s slimmer than I’ve ever seen her, walking/standing as if she’s in discomfort and there is absolutely no sparkle in her eyes–just emptiness. Please don’t think I’m body shaming her; far from it, in fact. This is said out of genuine concern: something is wrong and I pray that it is being addressed privately or, if it isn’t, it will be soon once more people speak up. Kate simply doesn’t look well and/or happy and hasn’t for quite some time. Even two weeks ago, when the whole family was on the balcony, while she was smiling (brightly) it didn’t match her eyes and I just didn’t see any joy in there. I know that she pursued this life, and William, for 10+ years but I don’t think she knew what she was in for in terms of officially being a “member” of “The Firm” and, judging by the flippant remark he made just last night, I really don’t believe William is a barrel of laughs behind the scenes. I said it about a month ago and I’ll say it again: she looks like she’s (physically) going through some sort of “rejection” where her body wants one thing and her soul wants another (I hope that that makes sense). Kimothy, you are onto something . I think your saying that her body wants one thing and her soul wants another, is very astute. Life has not turned out the way Kate thought it would, or so it seems. But, does anyone’s life ever turn out the way they thought it would? Still, most of us have happiness and let that show. It is sad that she is slipping away in the weight department. She must be very lonely at home, too. William doesn’t seem to be the soul mate she thought he would be. Where’s Carole in all of this? Or, Mike? This young woman needs help. Her sister must realize this, too. Kimothy that makes perfect sense. I said something similar but much less articulate below. Emotional pain is as destructive as physical pain. It seems like her weight is she can control. Reminds me so much of Karen Carpenters tragic story. Was that just bad early reporting, or did no one want to buy such expensive tickets? Does anyone know why it is now being reported that guests were not charged to attend? That’s what I thought, too. But the Express said something different so I went with that. I don’t know why there is that discrepancy. To the commentators who said braided updo, I was thinking the exact same thing!! You don’t even need a lot of hair to pull some nice ones off. I also like that she’s upping the bling a little bit. I love the old photos of the ladies in the late 1880s early 1900s wearing 4-5 diamond or pearl necklaces on top of each other!! Why not if ya got it. The first time she wore this outfit I thought she absolutely looked lovely! Having said that, I think her weight is the giant elephant I the room. They say the camera adds 10/15 lbs so I can’t even imagine what she looks like in person. That second picture looks like she could collapse herself down-just fold her up type thing. I don’t like to arm chair diagnose but it’s been clear since she’s had Charlotte things haven’t been quite right. At first I was thinking thyroid disorder (higher chance in women and after giving birth it increases)or even postpartum depression. They talk about if George or Charlotte needed help they would get it but what about hers? They could come out with a statement that she’s dealing with whatever and not ready to talk about it. In her college pics, she has cute little chipmunk cheeks and now they just hang off her face=( most people would give them the respect of privacy and support instead of snarky comments about throwing her a burger or 10 (lovely DM comment) wanting to break the stigma of mental health should begin at home. Thanks for a great post KMR!!! This dress has been one of my favorites since Kate first wore it to her first event as Duchess. She positively glowed at the ARC event, finally married to her college sweetheart, the world at her feet, ready to make a difference in the lives of so many. I recall at the time being a bit worried at how thin she was, this dress really highlights her tiny hips and lack of curves, but chalked it up to the stress of the wedding and all the weight she lost preparing for that day and was sure that once she settled into her new life that she would gain back the 10 or so pounds she lost. So I’m finding it distressing to see that it fits just a loosely now as it did 5 years ago. I mean, she is supposedly so in love with her husband, so thrilled with her new life, such a hands on mom, etc one would think she would relax her unrelenting exercise and diet regime, you know gain those 10+ happy, contented life pounds. I have to say when I first saw the photos of this event I found Kate’s updo to be a bit too matronly for this dress. I think it’s the slight bump at the back of the head that makes it look more matronly than young and carefree, if you know what I mean. I think either a slicked back, low hung ponytail or else stick straight hair done in a deep side part with the one side pinned back would have worked better with this dress. OMG have you ever seen someone who’s head and neck jut forward so much!! She looks like a huge praying mantis!! And her posture while walking across the lawn brought to mind a walking question mark because she’s so hunched forward!! I can barely look at pictures of her anymore because her posture is so atrocious, it’s rather painful just to look at. Lauri I was waiting for you to comment. Kate is so very thin, has such terrible posture and I think her updo makes it worse. All that hair seems to be on the back of her neck not on her head pushing her head forward. I’ve never had long hair, never had an updo so I’m not the best judge but this doesn’t help. Sorry to hear you’ve not been well and do hope you are feeling better soon. Ahh Lauri i am sorry you are sick. I hope you feel better soon! It was shocking to see the side by side photo of 2011 vs 2016. I can’t believe how much thinner she is and how much worse her posture is. She looked so confident in the 2011 photo. And yet at this event, when she should have grown and feel even more confident, her posture makes it seem like she is hiding. Such a striking difference. Hi Overit, yeah it does strike me as odd that she looked and behaved more confident and secure right after the wedding then she does 5 years on. When I read the Pro-Kate factions going on and on about how confident she looks, I have to wonder are they seeing photos that I’m not? Personally, I don’t think she really knew what she was getting into Royal Family and “work” wise, William didn’t include her in anything family related for quite a long time i.e. visiting Balmoral during the summer with the family is just one example I can think of, I think most of their courtship involved doing things with her family and as little time as possible was spent with his. To this end I think she is wholy unprepared for the family dynamics, the family politics and of course the “work” involved in being a member of the royal family, of course William did promise Mike that he would protect Kate and that is another reason why this woman remains unprepared for the harsh reality of royal life. I shudder for the time when these two become The Prince & Princess of Wales and weep at the thought of them being King and Queen. You are perfectly coherent Lauri – even when ill! Hope all is settling down for you health-wise and that you are on the mend. Sorry to hear you are not well Lauri, I’m hoping you are feeling better now? Of course the heat will not be helping much. Take it easy for the next few days? Lauri, I was missing you Iam sobsorryvto hear that you don’t feel well. I hope the medication helps. rhiannon, by the way, how are you doing? don’t they bite the heads off the males? ah a headless Willy. Hi Miss K, no you’re not crazy!!! I too, thought about Kate ripping Willie’s head clean off after mating! But then remembered that if she did, there goes her meal ticket. You are very naughty Kimothy. Love ” Great minds think alike but dirty minds work together.” Gold. Oh my gosh, last night I went out with a couple of childhood girlfriends (and the 7 year old son of one of them) and we had an absolute blast. We went to a loca Thai restaurant (where I nearly got carded when we asked for 3 glasses for the wine because the server didn’t think I was 21! The girls assured him it was okay), attempted to go to an outdoor concert but were late and it was packed so we turned around and went to a local shopping center. First Bealls Outlet and then Ross. Wow!! We had such a good time going through all of the gowns (Amber and I are planning on attending the adult prom, that’s two hours away, in a few weeks), trying them on (all 3 of us, in 1 large dressing room with our differently shaped adult bodies LOL!) and I found two dresses that are not what I’d normally wear but both Amber and Jammie insisted that I try them on and oh my God!! They both have crinoline underneath and in one (that was black with white polka dots and a wide belt) I was twirling around, feeling like a little girl! Then we went to a college restaurant (where I live, it’s a college town so we have places open late), ordered food AGAIN (plus, I had to take my medicine) and we felt like mini cougars drooling over the college-age waiters hahahaha!!! One of the girls was especially gaga over this one kid but I was liking our waiter because he was that nerdy cute with a beautiful smile. Anyway, at one point my stupid cycle just had to remind me that it was still there and I felt lousy when we were leaving. I then had to go to the 24 hour CVS to get toilet paper (plus feminine products) and FINALLY got home at like, quarter to 1 in the morning!! Since I’m programmed to be an early riser, I woke up just after 6 which means I got less than 5 hours of sleep. Yeah, I’m going to post-pone my grocery shopping to later today or even tomorrow (I have leftovers from both the Thai place and the college shop). P.S. Hope this isn’t TMI or too much. Let me know if it is!! I’m sorry to hear you have been sick, Lauri from Ca. Get well soon! Lauri, sending good wishes your way. I hope you are feeling better and are on the mend. Hello, I couldn’t resist to point out that Kats face is the result of many face lifts and and some other cosmetic procedures. Looking at her photos before weeding she doesn’t look like herself anymore. To make it less noticeable she goes through intensive weight lose so she can blame the changes for it. She did it before wedding, before visit to Denmark ( notice in video how stretched her skin is, she hardly was able to move her jow)and before trip to India, no wrinkles, no eye bags (this is the reason she didn’t attend the Irish shamrock celebration). At some point all this procedures stop working and is time for a new one. I love this website, the commentary is always so smart and insightful, plus everyone is so supportive of each other! I agree with everything that’s already been said about Kate and William. The other thing I thought was Kate looks the same way I did when I was younger and my parents made me go somewhere I didn’t want to go. I wish she would be more engaged. William does look especially glum to be there! 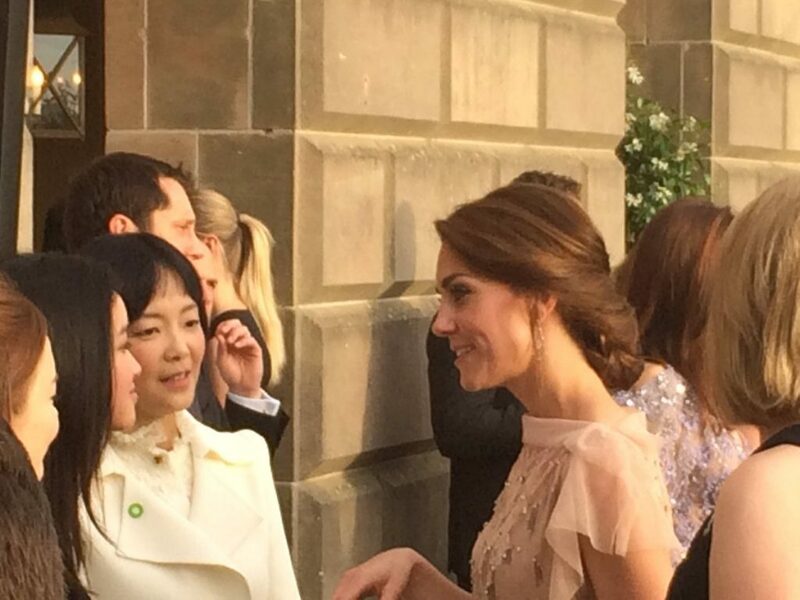 Kate seems to be be trying – I’d imagine her job at the event was to mingle with the guests who’d either (a) paid a lot of money for the event and probably hoped to meet Kate, or (b) encourage well-heeled guests to donate by speaking of the the work EACH does. But I agree, Kate does not look naturally comfortable here. They both seem unhappy/unwilling doing royal duties, that’s for sure. And here I thought she looked the most normal she ever has — hobnobbing with a bunch of other rich people. I mean she actually allowed us to see she had a glass of wine in her hand. I think they are polite but not overly engaged. The wine was still in the glass though. I’m sorry to say this, but she has fillers in her cheeks, believe me I know I have them as well and it is VERY obvious when she smiles, and it’s just absolutely frightening to imagine what she would look like without. She is scarily thin, one picture of her reminded me eerily of one of Princess Victoria when she was anorexic. The Swedish court was quick and openly admitted that she had a problem and that she would retire from official duties and have her problem addressed. The reason she developed anorexia was that she suddenly realized what being a crown princess meant. I think it must be immensely stressful to have every official engagement scrutinized and judged to bits. We don’t like her hair down, when it’s up it looks matronly, if she wears a nice dress the accessories are not right, the color is off, the shoes are wrong, the eye liner too heavy, the eye shadow is too sparkly, the toe nails are not painted, it is never ending and she is picked apart mercilessly. Imagine you go out and all your neighbors pick you apart and then comment on social media, it is hell. When Princess Diana was around there was no social media. Everybody has an opinion. It’s nice and good that people can exchange views, but to pick every single thing about her apart is just ridiculous. It’s no wonder that she gets more and more insecure, no one could live with that. She wanted that lifestyle but does anyone believe she had a clue how mercilessly we all are with her. We have no idea what the politics are behind closed doors. Prince Charles is an extremely vain man who doesn’t want to be upstaged. Would they do more it would harm Prince Charles and his quest to have Camilla accepted as Queen. It might not be their choice, we don’ KNOW. It wouldn’t be her that calls the shot anyways. If Prince William decides he wants privacy, she can’t go out and do engagements. Prince William is the loon in the family, she just does what is expected. There is whole palace machine working in the background and she can’t march in and change that. I think it speaks volumes that William wanted his own staff at KP is isn’t seen much around Prince Charles. I can only speak for myself, but I’m sure I would crumble under that amount of scrutiny and criticism. In order to be uber critical we should all have a hard look at ourselves and hope that she gets the help she obviously needs and that we all give her the space to do that. The thing is, Kate isn’t really picked apart by the media (only on a few blogs, which i doubt she reads). The media always praises every little thing she does. They are not that critical of her appearance. In fact, if anything, i could see it boosting her ego since all they do is praise here. There is very rarely a bad article about her. She has actually been very lucky as far as celebrities go. And honestly, most the Kate blogs are over the top in praising her. They treat her like she can do no wrong. Just the other day i commented about how there is a video of Kate singing in a play when she was 12 or something. And her obsessed fans were saying how she was so good she could have sung professionally-even though she sounded like any other kid singing. But it proves my point that there are so many sites that just worship Kate-not tear her apart. Sadly, people only talk about what she wears since there is nothing else she gives us to talk about. We can’t talk about how sincere she is or caring since all she does is show up and be pretty. That may seem harsh, but that is her and William’s doing. It would still be hard to be in the public eye, but Kate has been fairly lucky since she is so worshiped. And she sought this life out! In the dating years, the media was not as nice to her-they were down right mean. Yet, she stuck it out and actually seemed to thrive. She was happy and confident during her 20’s when the media was brutal to her-that would have been the time it was hardest for her and should have caused problems. Now, when the media is nice to her, she seems to have problems. I don’t really blame social media for her problems. I think there is something inside her that she is struggling with. It seems to have started after having kids so it may just be postpartum depression that she won’t admit and deal with. I just hope she acknowledges it and finds the support she needs. I agree with you Overit! In my opinion the media should be more critical of her, then she finally would understand to improve. And Chanelchen Kate doesn’t do what is expected of her, if she did she wouldn’t have had so many misshaps. I agree! It seems the dissatisfaction is from her home life. As she said at the engagement interview, she only cares what William (Don’t you KNOW who I Am?) thinks. Yeah I don’t think she’s reading critiques of her shoes and lack of nail polish. I don’t have much to say about Kate’s look except that dress was beautiful the first time she wore it but now it only looks like the emphasis of the difference between old Kate from her golden era and present Kate who looks terribly thin and dramatically aged. Does Kate have any personal jewelry besides the diamonds from Charles? I know she has thoughs emeralds I did not like the first time around, but everything seems to be loaned from the Queen. Maybe instead of buying KiKi’s she can get herself some bespoke beauties. I kind of liked this dress the first time around. Now I’m not a big fan of it. I don’t know if it’s because she looks so emaciated in it or that her hair is up and showing more of the shoulder work. Good that her hair was up, but for Pete’s sake get rid of the extensions and get a hair stylist who will give you a fun up do that sits higher on your head. Sleek or a little messy would have worked wonderfully for this dress. That giant knot at the nape of her neck makes her look even older than is needed. The crack from William was typical for him. He really doesn’t know any other way to try to be funny. I don’t know what’s going on with Kate but she needs to get some help and get it sorted out. She is wasting away. I know she and Carole seem to follow the Diana playbook a bit too closely, but I hope this thin phase isn’t a mimicking of Diana’s eating issues. It’s just so wrong. 2) Marie Claire, an American publication, is actually posting an article about things that Kate has done wrong. It’s not super critical, but since US mags are always so fluffy and positive about her I thought it was really interesting that one seems to be calling her out a little bit. Congratulations KMR!! To be quoted is great!! Thanks for the link, Liza, that’s cool that they referenced me. Granted most the snarkier points were made by the British press, it’s still interesting that Marie Claire even published them. My favorite “Mooning the world is the most interesting thing Kate Middleton has done”. Bahahahaha!!! I may laugh at this but it’s also rather sad that it’s too true! I wonder if what we’re seeing now is a Kate without her base of support- her parents, Mike and Carole happily together. We know William would be difficult to deal with, we know public scrutiny would be hard… But those are factors that aren’t new to her. I really wonder if there is validity to the rumors that her parents are no longer together and its rocked her world. Some of my friends who have had their parents separate/ divorce later in life have said it is extremely hard to deal with and the emotional toll it takes is heavy. Her family was sold as so solid and happy and what William wanted… Things have been super quiet for all the other Middletons lately. Just makes me wonder. I think this (if true) could be a factor. The Middleton’s have been uncharacteristically absent from the tabloids this past year. However, they did appear as a family around Christmas-New Year at Sandringham, all staying with the Queen, I think it was reported. Further, it was rumoured that Carole was living at Anmer Hall; this might provide further stress! But ‘the Middleton’s’ were ‘sold’ as the solid middle-class family to William, as you say. If it’s been held together with duct tape for the sake of appearances or for material gain and status, more’s the pity for them all. Glad you agree! I just know that family turmoil and crumbling facades (and possibly your mom living with you?!?) can add up to a crap ton of stress and can make you look pretty haggard. Maybe this is why they’re also pushing for mental health too? It just seems like since Charlotte (as someone up thread mentioned) there has been a definite change to Kate and it just seems like it would take something on a bigger scale to affect her- we know she can be steely to hang in there for 10 years and ignore the public’s criticism while doing so. But she had her parents’ full support and unity behind her back then. Hope this makes sense and isn’t a wild ramble! If there are post-partum issues, then it is in everyone’s interests to issue a release to that effect and withdraw Kate from public life until it is resolved. While I understand family trauma, as Red Tulip said, Kate needs to grow up and deal with it sensibly as many others have had to do. She is one of life’s takers so any adversity would be difficult for her to face and work through. But having Carole living with them… shudder!!!! Kate’s a grown up and all grown ups need to deal with life’s setbacks. That doesn’t stop them from working or trying to live a life. But of course, our precious Kate is a delicate child in a skinny adult’s body and she has never had to deal with any setbacks has she? She’s always had people around to look after her and be gentle with her, hasn’t she? In a way, good if she’s needing to deal with the setback of her parents separation (if it is true); adversity will teach her some character and will force this 34 year old woman to finally grow up. I’m sorry I cannot sympathize or empathize with this person who only selfishly takes and takes and takes but gives very little back. I know that I am repeating many well sated comments, but OMG I gasped when I saw these pics. A combination of things just didn’t work. Five years ago, her rose colored pearly gown was worn against a bright background with perfect lighting that made the dress ethereal. This week it was worn at twilight where there isan almost golden hue to the background She seemed to simply fade into the background with all of the warm hues. She needs brightness. Not even the jewels seemed to glitter. Her hair color is all wrong, I agree with a poster above. She needs to get rid of he red and bring back the brown with ashy undertones. The red again washes her out. A stylist would have a sense of her coloring, the lighting, etc and work with, not against, it. This was one of my favorite gowns, but this week it had the feel of a worn out velour dressing gown. The dress wore her along with the accessories. It made me sad, like she is grasping at straws to restore her former glory only to highlight how she looks like she is being eaten alive by internal struggle. She is suffering from something, emotional or physical I do not know, but it makes me sad. The skin, her makeup. Where to begin! The amount of makeup she wears is astonishing. It matches TammyFaye Baker in comical amounts. The colors are all wrong, don’t even think she wears the proper color of foundation. The eye shadow would look beautiful on someone with Autumn coloring she needs brightness and softer colors. And subtract, do not add, to the amount of eyeliner by lining the inner waterline in black Cleopatra and Elizabeth Taylor could pull it off. It didn’t work on Diana either, but at least she used youthful and softer colors. Lipstick, lipstick, lipstick. Or a shimmery light reflecting gloss. channel and bobbi Brown make beautiful lip gloss. Cant talk about that anymore, sorry for the rant. She is disappearing, literally and figuratively. I like the glass of wine, but it seems to be filled at the same level in all pics so I wonder whether she was really drinking. Perhaps a trick to dispel pregnancy rumors, though all you have to do is look at her. Aye sorry for the rant. Hi Reilly, I’m so glad that I’m not the only one who felt Kate wore way too much eye makeup! Tammy Faye Baker, hahahaha!!! After the Vogue cover shoot I was hopeful that she would ease up on the black eyeliner, it’s such a harsh look, very dated and aging. hi Lauri! it is driving me nuts. the amount of liner combined with heavy eyeshadow colors that don’t suit her skin tone is befuddling, esp when she has access to help. ha – the only thing she learned from Vogue was the Chewbacca eyebrow technique! This is ok Runner, as long as it makes you feel better. Question off topic, and I don’t want take this question under a political angle, but speak about the consequences for the monarchy : but Scotland want to stay in the UK, if they ask independance : it means that the Queen has no longer role ? Do you know what will become the royal residences in Scotland? I wonder if it is in this context some people will interrogate the concept of monarchy or if the future seems instable on the economic point it will reinforce the monarchy? I think the fact that the Queen is the queen, and that it is not Charles play in favor of the monarchy. I know we don’t speak politics, but what I wanted to evoke the monarchy, and not giving my opinion for the vote. Sorry if I offense someone. When Scotland had a referendum they said they would keep the queen and therefore her palaces. We shall see because today’s vote may trigger Scotland to vote again. I am just curious to see what happens now with the UK leaving the EU. Will that affect the monarchy at all? Well, Balmoral is owned by the Queen personally, so even if Scotland leaves she would still keep that residence as it’s her personal property, right? KMR – Yes, she would. The SNP is saying they will use this as a reason for a second referendum as Scotland wanted to remain in the EU. We’l see if the UK is really out of the EU. Nothing’s solid at this point, just a mess. EU leaders are meeting Monday morning to expedite the exit, at some stage it will be behind closed doors, excluding Prime Minister Cameron. It appears that once rejected, the EU wishes to end the relationship quickly and cleanly. And I thought Highgrove was owned by Charles outright. But the homes of Princess Anne, Prince Edward, Prince Andrew and Prince William were all gifted to them out of the Queen’s managed estates. I wonder what will happen to those. I thought the Queen also owned Sandringham. But KP, BP, WC, St. J, CH, and others are owned by the state I believe. Princess Anne owns Gatcombe Park – it was a wedding gift from HM. Prince Edward has a 50 year lease on Bagshot Park from the Crown Estate and pays rent (which is re-evaluated every 15 years – currently I think it’s around £90,000 per year). Prince Andrew has a 75 year lease on Royal Lodge and a few nearby cottages from the Crown Estate. In lieu of paying rent, he paid £7.5 million for renovations. Anmer Hall is personally owned by the Queen as part of the Sandringham Estate (some sources differ and say the Queen gave it to them outright as a wedding gift, so who knows?). Either way, I assume they don’t pay anything. Thank you for the info. It is nice to know that some of these properties are being paid for. many interesting and new questions now must be addressed. as with Clem, no politics here. just wishing Britain the best of luck. regardless of opinion, this is living history. Brexit has really been all over the news the last week here in the U.S. It was interesting seeing history with this vote. Wish all the KMR regulars in the U.K. the best. I know this is not a political blog, but I join G in sending best thoughts to all the UK commenters. I am not the best person to understand the full impact of this vote. Basically, the news here (USA)slants things one way, only. When I have time (WHEN WILL THAT BE? ), I should read news from UK papers. I just hope things go well for everyone. This is monumental decision, I am sure. Aside from the personal feelings of the Queen about an independent Scotland, the Scotland Act of 2016 (assented to by the Queen in March) will pass the management of the Crown Estate properties in Scotland to the Scottish Government. Revenue profits will now go to the Scottish Government. In all likelihood, Scotland would retain a “Queen of Scots”, similar to HM being the Queen of Canada or Australia. The Balmoral Estate is the personal property of the Queen, so there will be no effect. The Palace of Holyroodhouse is an Occupied Royal Palace but the building is maintained by the Scottish Government. Revenues from the Royal Collection Trust (entrance fees, sales in the gift shop, photography sales, etc.) are used for staffing, exhibitions and conservation of the contents of the building. It is open year round except when the Royal Family is in residence (Holyroodweek starts on Monday BTW). Hope that explains a few things. It’s rather complex as to “who owns what” and “who is responsible for what part”. Would you consider doing a post on how Brexit affects the monarchy? I’m an American, so I honestly have no clue really about what Brexit means and why it happened. The only thing I had really heard was that William was for it and made a reference to it in a speech and the royal family isn’t supposed to be political from my understanding. AFAIK William was not for it insofar as his statement talked obliquely about Europe and Britain being together. Something like that. The referendum as far as I’ve read isn’t really legally binding but the people’s voice and they can still not pass it as Act of Parliament, could go back to Brussels for negotiation if this scared the EU which it probably did as it started off the Dutch and French talking about exiting, etc. IMO the EU is a sinking ship but without it Britain may be in some dire times economically. And maybe no more UK if Ireland and Scotland have referendums. I hope that wasn’t too political. I have no horse in this race. I can see how one could go either way on this one. For France it is the right extreme party Front National that wants the referendum. In France : people know that EU needs reforms and change but I think that the majortiy of the population prefer to stay in the EU for economical reasons and political reasons. Thanks for your post. I too don’t want to post off topic, but the popular vote and how it may extend to the BRF intrigues me. Being a Yank, I don’t understand the royal entitlement. Of course we have our own issues here, God help us. I’m a Yank too but my grandparents were Scots, and on my moms side I have welsh family, so I like to keep informed! Haha. I’m pretty much Irish in ancestry. If I were of any importance to the Brexit debate, Boris Johnson would have another field day with that. The Royal family is a total irrelevance in the huge decisions that need to be made. They are just going to potter along as ever. We’ve had wall to wall coverage all day not one mention of the royals. Crazy isn’t it? I was thinking about that yesterday, envisioning King Harry out talking about Brexit, what he would do as king to inspire the culture, set the tone, focus on issues. Leadership matters even when you are in an “ambassador” role as they are. I can’t make up my mind if HM was right to not to take a side and lay her case out why. I think a strong argument would have gone a long way, but I’m confident in England to spank the world with how fabulous she is. I’m English 3rd gen back immigrant to America. Sending you a hug Birdy. Your mates here at KMR are all with you as you chart a new course. Hi, KMR. I am truly ignorant about the reasons for the success of Brexit and googled a few news articles to learn more. But I find it intriguing that the democratic process pushed it through because many people were sick of the money and regulations that are part of belonging to the EU. I wonder if this populist movement could extend down the road to the monarchy. Elizabeth is extremely popular, but the other royals are not. I’ve read that each Brit pays just a tuppence annually to support the Royals who are obscenely wealthy. Yet that annual 40 million royal “pension” could go towards more deserving health care services or any other public services. Will people next move to lobby to financially cut off the monarchy once HR steps dow? Of course I think of Wills and Kate who do nothing to earn their priviledged lifestyle. If anyone else can educate me, I’d appreciate it. What is clear is the Leave vote will act as a trigger to many European secession movements. Europe has re-drawn its boundaries many times over centuries and there is no reason to think it won’t happen again. That Scotland may re-ignite an independence debate again has also been hinted at. In the context of this blog, the Leave decision could well affect the futures of several monarchies, some of which are on shaky ground anyway and has been mentioned here several times. The BRF may not be in that position just yet but as you point out, it is the Queen who is popular due to the fact that her long reign has been part of pretty much every UK person’s life. Several members of her immediate family, however, either polarize or meet with indifference. HM once said (I think it was her) that indifference was the greatest enemy to the future of the monarchy. I’d also add social injustice too. We live in interesting times! It might be interesting from the other side of the world it is bloody terrifying here. Jobs and contracts already lost, sterling value crashed, stock market chaos, essentially no PM just when we desperately need leadership. The opposition leader with a no confidence vote, and we can’t leave now. It is going to take years of pain and uncertainty. And we have a strong majority of elected MP’s who don’t support the decision they now have to make happen. hi Birdy. this is a momentous event and I am livid that most American coverage is full centered on the impact on America when Britain is in a state of chaos. the coverage I see seems self centered. I am not making political statements and I have been following this for months and never settled on my own opinion. I know that our friend Britain is going to have it harder before it gets better and for that I am sorry. the American political cycle is on a run that we have not really seen before and it scares me for the sake of our Republic. without getting kicked off!! I do want to reiterate what I said earlier, that I wish our friends in Britain and the nation’s political institutions the best of luck in getting through a difficult time. Hi Birdy, I still have the BBC on – it has been non-stop live coverage since just before the polls closed. I can well understand the confusion Brits must feel now. I’m too far away to have a horse in the race or to understand the full nuance of local arguments, but like others here, hope the best for you all. I have no doubt that Brits will rise to and conquer all challenges placed in front of them as they have always done. Regardless of politicians’ own feelings, it is their job to make transitions happen as smoothly as possible. That is leadership. Cameron made an error in judgement tying the result to his job but he is doing the right thing in shepherding through change as best he can until a new leader is found. My use of ‘interesting’ was not dispassionately made. What people were really voting for has yet to be revealed and that seems to be happening now. The rhetorical triggers around ‘reclaiming’ the UK, being ‘independent’ allow people needing to protest their own feelings of powerlessness to confer blame eg to immigrants, elites, etc. The ramifications to Australia have also been discussed over here, as I imagine each country is starting to do – we live in a networked world. Additionally, we have a federal election next Saturday for both houses of parliament and many MPs are looking shaken (call that self-interest!) with a volatile electorate prepared to turf out politicians/ act against the status quo quite quickly. We have seen two states throw out first-terms governments which in the context of Aussie politics is a new phenomenon. Tying the discussion back to this blog, I do wonder how status quo symbols, such as royalty, fare in such politically volatile times – whether it is clung to as ‘comfort’ in times of turmoil or whether it is on the list to remove. Jen, in interesting times, royalty always suffer. The populace tend to be dissatisfied with their elites, especially royalty and turf them out unless said elites make appeasing changes pronto. It’s happened every single time in history. Every royal (and elite) hopes to live in boring times because then they are most secure. I’m not so confident. It is difficult to explain how devisive this has been and how far apart people are- Scotland and Ireland and London voting In , England and Wales Out . Talks of independence for Scotland, N & S Ireland uniting and staying In. One thing we are not it is United. Political infighting with so few elected MP’s supporting the decision is going to make it even more devisive. Also talk of a snap General Election which will be more painful. Thanks for that insight, Herazeus. But do we learn from history? Always dangerous for elites to take citizens’ compliance for granted. Jen, considering how often it has repeated in every single country world wide, and in every century, clearly this particular lesson never sticks. In every single case, the masses revolt in some way if not completely toppling the elites, and society is remade. Until next time. I hope when the dust settles things return to a new normal for everyone. I’m a believer in things working out in the end even if it’s hard now, but I am so surprised Cameron resigned and the no confidence vote in Corbyn isn’t surprising. Do they /have/ to? I know it would be political suicide to not listen to the will of the people with a referendum. I get why one would vote Leave, and why one would vote Remain. The UK was fine before the EU, and I’m confident Britain will be fine after the dust settles, but in the interim it will be painful. It is sad to see so much name calling elsewhere and hatred for people who voted Leave like on my Facebook feed. :/ I think it won’t be so bad as the doomsayers have said, but it will be a bumpy road for awhile. The biggest thing (and I think its GREAT that so many Americans are talking about Brexit–know what is going on and why this is so big–what a difference to a few years ago when people largely were clueless about the state of the world) I say to all my friends is to support England, this was their decision and we need to be there for them now more than ever, as a true friend. I hope all of you here at KMR that are in England know that we are here with you in spirit no matter which side you were on, and that we will always be your friend and ally. God speed. It is interesting (the Brexit), I read that the 2nd ask on Google in UK was “What is the UE?”. It appalls me : the lack of knowledge and pedagogie about the functionnement of UE is a big issue and the failure of UE. People who searched not info by themselves, but listened to politicals (and it is comprehensible because people don’t have always the time or the desire to search…) can not really understand the negative and positive aspects of the UE. It is a general observation which concerns not only UK but other Europeans countries. -> It is difficult to make UE interessant for student in college or in lycée (I am an history/geography teacher). In general, the lack of political culture from the youngs is terrifying, like the fact that the results of some election is determined by people who don’t have a precise idea just one hour before voting. It is the magic and the horror of the democracy : each people can express its opinion (and that is good), each person has a voice (it’s good too); but it is terryfing too. -> I don’t want to say that all the Brexit or Remain voters are ignorant, but for some voters ignorance is present (and that the case in each election of each countries). Some people said the the Brexit voters are just concerned by the question of immigration : it is false too, there is many reasons which push people to vote for Brexit. But saying that none Brexit voters was concerned by the immigration is false too. Honestly some questions or affirmations that I listened during this debate was appalling : question of entry of Turkey in the Union which is always used by political party in UK or France (The Turkey will not enter in the UE for the simple reason that the conflict with Chypre is always present and that the political climate is not positive for new entries, and that the majority of the european countries doesn’t want Turkey in UE), the fact that British money given to UE will be using for the Health system (and forget that the farmers will not have received money for UE…). The other thing that appalls me is the lack of preparation by both camps Remain and Leave to the after referendum. The What’s next is not prepared, from what I hear from France it seems that there is some unpreparation. I don’t know how Jo Cox murder has been used by the two camps (it is bad in the two cases, even if I can understand when the husband explains that his wife is murdered because of her ideas) : but personnaly I hate the sentence of Nigel Farrage : “We done it Without a single bullet being fired” : no words… It is only a week, has he already forget? (An actuality replaces another actuality with rapidity, we forget and that is). I want to say to British courage and strenght for the next months (but in general for European countries which feel the repercussion of this decision): for the econimical aspect, but too for the Union between Britishs (because if Brexit wins today, at the end of the day this choice doesn’t make consensus : the results are tighten but it is the democracy.). For the decision of Cameron to demissione, I find it normal : the majority of the people doesn’t accept to stay in UE, he was for the Remain and I think it is logic that he doesn’t negociate the accords with UE (he has no more credibility). I don’t know the future of the UK (bad or good -> nobody knows), don’t know if the Brexit will be a good or bad decision, but i think for now that the only thing that this vote has provoked is a division in the british society : independance of Scotland maybe, reunification of Irland (doubtful but why not…), some people want the independance of London (very unrealisable). It is terryfing and interesting to live this (like I am scared that my country will be governated by a right-extremist female who want s to suppress rights for gays, womens). I hope that my observation doesn’t hurt people, sorry if I speak about political on this blog and if I break the rules but I wanted to express my ideas. Clem, this is a lovely post. I agree – the American media has been unbearable today. I confess to go ogling the EU today, but that was to make sure that I educated my my 13 yr old as much as possible on what is going on. my children will form their opinions, but I do my best to make sure they have as much factual information aso possible. Jen, thanks so much for the wonderful post. I love KMR and the KMR community because it’s a springboard from fashion to the world at large. Birdy, I’m hoping for the best for you and the UK. It must be terrifying there. I agree so much. the discussions of the world at large, esp from those most impacted, make at least me feel more in touch with the world and the reality of it. I am a life long student of history, so what is being described as the most significant decision in Europe since the one to enter WWII puts me in awe of the times we are living in. hearing from those directly affected brings it home and provides perspective. with no intention of offending, it invokes memories of being in DC on 9/11. not the same, but the terror uncertainty economic impacts and inability of leaders to tell us it was over resonate. for me, the world became 9/10 and the new world on 9/12. Times like this, I miss Seth and his insightful commentary on the state of British politics :(. I feel like he would have some very interesting opinions on this new vote. Yes, 9/11 was one of the world’s defining moments. You are absolutely right there. Like you, too, I am a student of history. The events are alike in that, as with 9/11, the Brexit vote will also prove the human spirit’s resilience. Prince William and other elites were fine with staying in the EU cos they knew they’d never have to deal with refugees hanging round their mansions and fancy neighborhoods. Back to the outfit: This is a win for me. I think the undo with this dress suits the outfit better, and I’m a huge fan of the chunky diamond bracelet! I’ve read this before and came across it again today and it does speak some truths about my generation. (I’m a few years younger than Kate.) But I found that this could explains a lot about Kate and why she seems so unhappy. And when you read it saying “career” just exchange it for “bagging Prince William”. At least that’s what I did when I thought of this with Kate as the context. I went to the link and read the article. It was very good. Thanks for the heads up. I ended up reading a couple of things. Enjoyed them all. Hey, guys. I understand that the Brexit vote is a hot topic right now, but in the interest of not insulting people I would appreciate it if we stuck to the “no politics” policy from here on out. Thank you for understanding. could you please delete my response. I sincerely apologize for engaging. I know better than to do that. I am sorry. It’s not your fault, Reilly. I didn’t delete that comment quick enough. I appreciate the understanding. thank you. Sorry for posting about it KMR! I tried not to get political at all (being an American I have no horse in the race!). I really appreciate that this community is so together however. People can disagree but we’re always civil and friendly and compassionate. I really like that. You’ve fostered a great place for everyone here. I apologize as well! I never meant to bring this up in a political sense. I’m sure the royals are feeling uncertainty, as we all are, about how this will all play out. Didn’t mean to bring controversy at all. The latest news is about London voting to break away from UK & joining the EU & declaring the mayor, Sadiq Khan as the president while Scotland still wants to be independent from UK & join the EU. So what will be the status of the British Monarchy? Can the Queen still be the Queen of UK when the states/cities are not united anymore? I hope this is not a political question. The Queen can be Queen of any state or city state which wants her I suppose. She is already Queen of Australia, NZ, Canada and several Caribbean islands, plus Tuvalu etc. So her position is unaffected at the moment, although as Herazeus has said political chaos does often affect royalty. Think Russia for example. My guess is that with summer coming they’ll all keep their heads down . Interesting that Trump was in Scotland yesterday. We are all laughing at the thought of Trump and Boris ‘ruling the world’. Not for political reasons, KMR, but their hairstyles…..oh my god they could start a whole new trend. Thanks Birdy for your input. I’m sure the Queen is feeling sad about these uncertainties. Too bad after the hype of her birthday celebrations. I hope everything will go well for you, Birdy. Thank you IDA there is a lot going on here it will be interesting! just busted out laughing Birdy. you have to keep a sense of humor! I can barely bring myself to look closely at Kate these days, especially in these photos. Is this really the same woman who wore this dress so beautifully in 2011? It’s painful to see someone wasting away like this. As I have said many times here, I hope she gets some help soon. As another poster remarked, it is similar to Karen Carpenter’s decline. I pray that someone forces her into treatment for whatever is ailing her and causing her to age so badly and become emaciated because I don’t want to see another Carpenter outcome with Kate. Hello everyone: This is my first comment on this blog. First, thanks to KMR for affording me the opportunity to be able to express my thoughts an all things pertaining to KM, DOC. Hi & welcome Vonnie! I think Kate is recycling her old dresses & gowns to evoke positive remarks about herself. These outfits are still beautiful but unfortunately Kate, the wearer of these outfits is not the same fresh-looking & radiant duchess anymore. What a waste! I didn’t feel the gown flattered her body type on the first wear. But this time she elevated it with the jewelry and hair to show off the detail on the neckline. Much improved! William looks like a lazy SOB when he does button his tux jacket. Sorry but he looked so bored and uninterested in all the even photos I saw. Hello Ida: Thanks for your warm welcome, it’s much appreciated.